Full-sized set-top boxes based on AMLogic AML8726-M3 processor have the potential to support XBMC Linux & Android with proper hardware support, but are not always priced very aggressively. 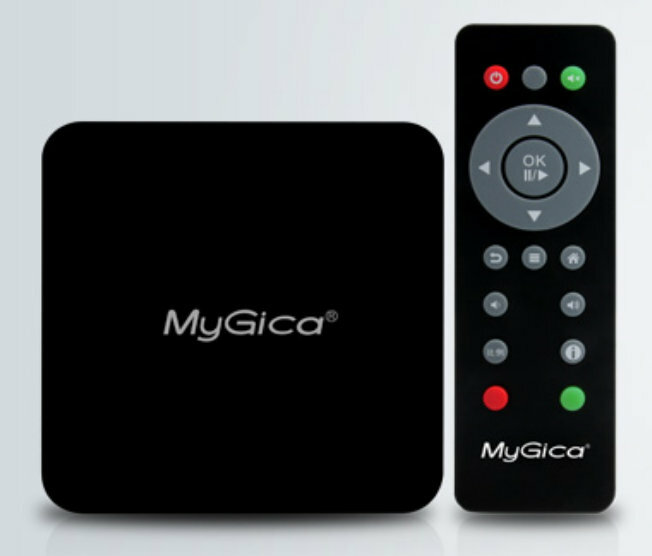 But today, I’ve stumbled upon MyGica A11 Android 4.0 media player powered by AML8726-M3, with 1GB RAM and 4GB flash that sells for $65.10 on DealExtreme including shipping, and just 339 RMB (~55 USD) in China. Beside the media player, the package contains a power adapter (100~240V / US plug), an infrared remote control, and a user manual in Chinese. You may have noticed Wi-Fi is missing, so you’ll need to use a WiFi USB dongle if you intend to connect to your router that way. However, if you don’t plan to connect via Ethernet, you are probably better off with one of those AML8726-M3 HDMI TV dongles. Davilla, one of XBMC developers, is working with Pivos to port XMBC Linux to their AML8726-M1 and M3 set-top boxes, and they’ve released a new beta firmware last week. However, this firmware is tailored for the Pivos STBs, and most probably, it won’t work directly on Mygica A11. But since the source code is available, it should be feasible to adapt it to this low cost STB. You can find more information on Dealextreme, or directly on Mygica website (in Chinese).